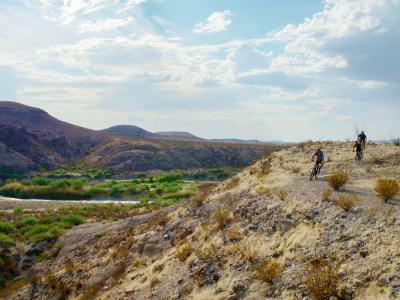 Find grit, speed, and astonishing vistas in Texas, where mountain biking trails go unmatched. We navigated rocky canyons and lush scenery on the best bike routes that the state has to offer. 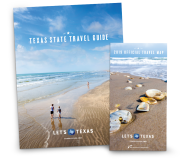 Texas, famous for its extremes, doesn’t slouch in the area of topography. Craggy mountains, heart-stopping canyons, and terrain of every conceivable texture can be found within its 270,000 square miles—so much of it is navigable on two wheels. We loaded up our mountain bikes in search of the state’s most daunting climbs, thrilling drop-offs, and sweeping views. Driving out to Palo Duro Canyon, you might be forgiven for having second thoughts about the area’s off-road offerings. Everywhere you look, there’s flat land as far as the eye can see. But the destination is revelatory. Palo Duro, the second-largest canyon in the United States, is a wonderland of multilayered rock, stark mesas, and boldly sculpted contours. Stretching 70 miles long, averaging six miles wide, and dipping 1,000 feet in some places, the basin is ideal for vertical and horizontal exploration. Biking is among the best options. 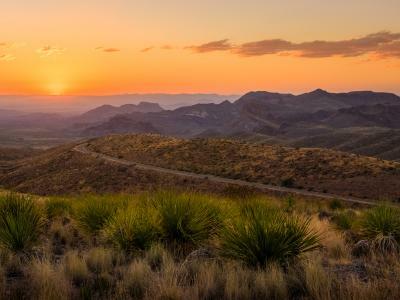 The canyon boasts 30 miles of interconnected foot, bike, and horse trails, each promising gorgeous views and varied terrain. Our visit resulted in a full afternoon of discovery that left us aching and pleasantly tuckered. We began with possibly the canyon’s best-known route: the Lighthouse Trail, 2.72 miles of leisurely path leading to the eponymous rock formation. The multi-use path is fairly wide, with few difficult climbs, although we did use one or two bypass trails to get past some of the steep parts; they’re among the many nice touches that accommodate riders of all skill levels. Under the warm desert sun, and despite our slow pace, we guzzled several bottles of water on the way to Lighthouse Rock, which offers a panorama of the entire canyon. The formation isn’t accessible by bike, so we racked our wheels at its base and ascended the rest of the way on foot. Climbing up and down the sheer incline was trying but completely worth it. On the way back from the Lighthouse Trail, we veered left to join the Givens, Spicer, and Lowry Running Trail (GSL), which is a favorite among riders. Coursing unpredictably for 3.08 miles through undulating terrain, this singletrack has ravishing claystone views and applications for some legitimate technique. We caught air with several drop-offs, and the superb traction of the red dirt gave us wings. Our final stint at the canyon was at Capitol Peak Trail. At 2.96 miles, it’s the only route in the park intended exclusively for mountain biking. More diverting on both the x- and the y-axis than the Lighthouse Trail, but not quite as gnarly as GSL, this singletrack proved to be the Goldilocks of our Palo Duro excursion. Occasionally abrupt slopes, coasting descents, and perfect traction made this one congenial ride. Physically spent and out of water—seriously, all visitors to the canyon should prepare to hydrate—we decided to forgo other trails and head back to the car. The immersive beauty of the place lingered long afterward, however, and we can’t wait to go back. A drive of about an hour and a half east from Dallas, the 13 miles of trail at Tyler State Park promise challenging singletrack for the rider with something to accomplish. A series of interconnecting loops winds north, east, and south in a sinewy “C” shape around the 985.5-acre park, which is a popular getaway for visitors in the Dallas-Fort Worth Metroplex. The park’s 100-foot trees and 64-acre lake cool the air, even as twisting, turning bike paths make you sweat. The wildlife views, too, are unparalleled. We spent a blissful morning navigating the trail, avoiding exposed roots and circumventing occasional pits. The trails are suitable for beginners and advanced riders; falling squarely in the middle, we certainly got our workout. Little Fox Canyon Trail, essentially an extension of Palo Duro Canyon&apos;s GSL Trail, is like an amped-up bonus round. Extending 2.31 miles, the trail features red-dirt traction and drop-offs that make for a high-speed romp.